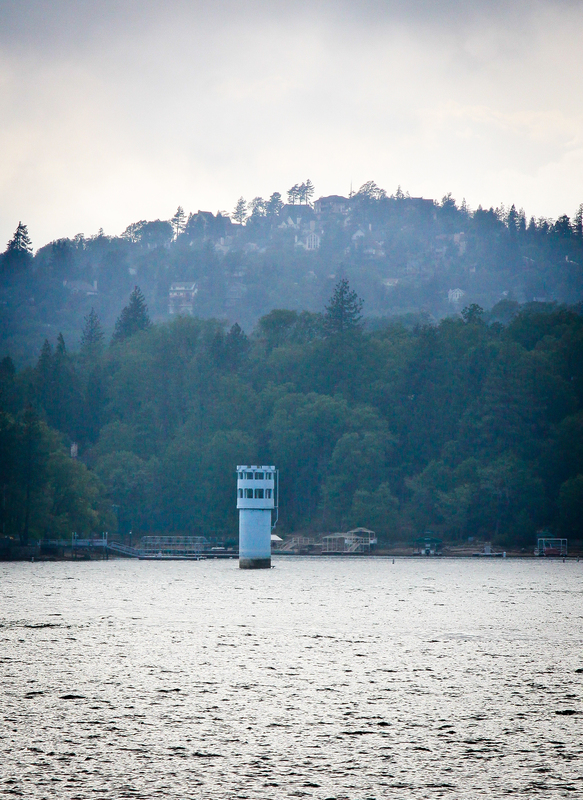 Have you ever wondered what that Blue Tower is in the middle of Lake Arrowhead? Here is a little history on “The Tower.” A recent article was published in the Lake Arrowhead Update Spring 2014, provided by the Mountain News, here is what it said. 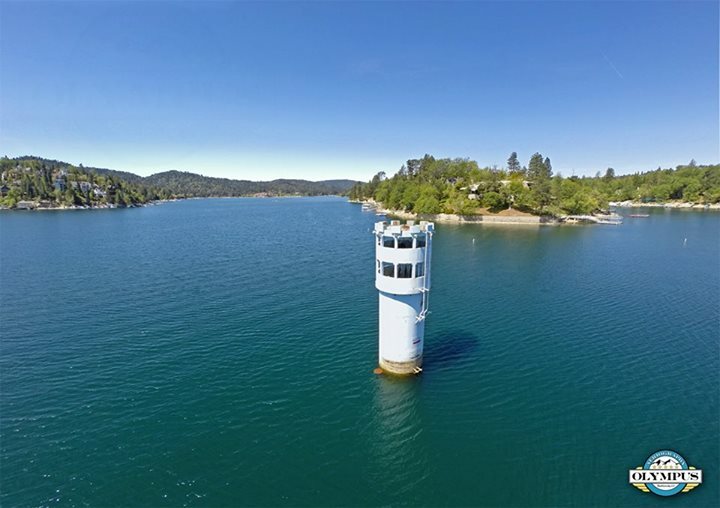 The blue tower that stands in the middle of Lake Arrowhead was built in 1908 by Los Angeles-based contractor Arthur S. Bent. The initial purpose of the tower was to release water for irrigation of crops in the San Bernardino Valley. The tower, which stands 43 feet above the water when the lake is full, is located approximately 500 feet off Eagle Point in 145 feet of water, according to the original contour map of the lake bottom in that area. The reinforced concrete structure was completed and dedicated on July 5, 1908. One hundred years later, the Arrowhead Lake Association and the Rim of the World Historical Society held a birthday celebration for the tower, complete with cake for boaters who passed by the tower on the lake. In her book, Saga of the San Bernardinos, the late historian Pauliena LaFuze wrote, “The Outlet Tower, at the portal of Tunnel #1 in Little Bear, was presented to the Arrowhead Reservoir and Power Company by Contractor Bent on July 5th  complete even to pre-cast brackets for an outside, outward facing ladder to the control room on top. “It was a giant poured-concrete cylinder with screened inlets at 20-foot intervals in a circular pattern, set on a 31-foot square six-foot-thick slab, resting on bedrock. The tower was 17 feet across the walls of two foot thickness, tapering at the 109-foot level to a 13-foot diameter and 15 inches of thickness. At the time, the tower was the tallest concrete water tower in the world. In one of his “Mountain Mileposts” columns, historian Russ Keller quoted from a 1910 issue of Technical World magazine: “At the lower extremity of this 880-acre basin there has been built, at a cost of $40,000, a huge outlet water tower which is unique in engineering records, to say the least. The tower is built entirely of concrete, 195 feet in height; walls two feet thick up to the 125-foot mark where they taper to 15 inches, with an outside diameter of 13 feet throughout, and the walls reinforced with three-fourths inch twisted bars. Construction engineers were F. E. Trask and F. C. Finkle. Colton Portland Cement was used exclusively. The tower was considered one of the finest pieces of concrete work in the country. The tower has been designated Cultural Landmark #8 by the Rim of the World Historical Society. 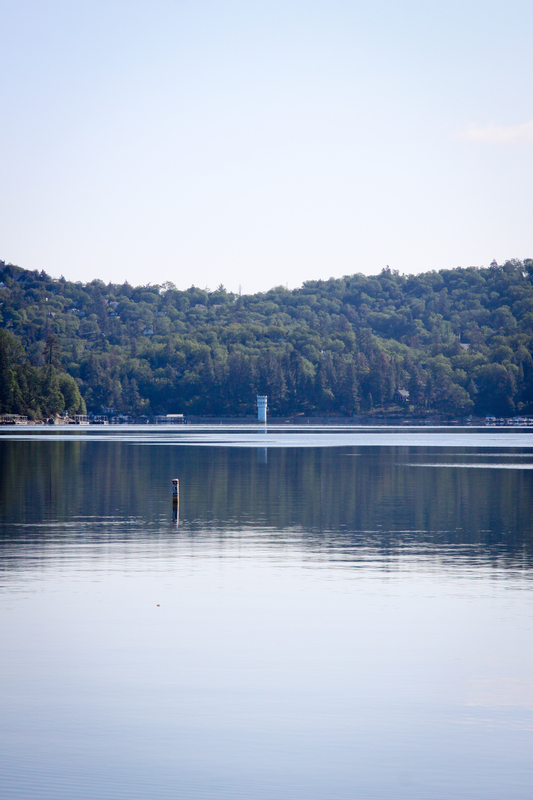 A dedication plaque is located at the Lake Arrowhead marina, where visitors can take a closer look at the tower through a telescope that has been placed there.